It’s here! The Zoom Rooms Scheduling Display is now available! Just download the new Zoom Rooms iPad app. Zoom Rooms have long been known to bring beautiful, simple, scalable video conferencing with wireless content sharing and integrated audio to any meeting space – conference rooms, training rooms, huddle rooms, classrooms, and executive offices. The original software-based video conferencing system uses off-the-shelf hardware for cameras, speakers, and monitors – making it the most flexible video solution that easily connects with anyone on mobile devices, desktops, and in other rooms. 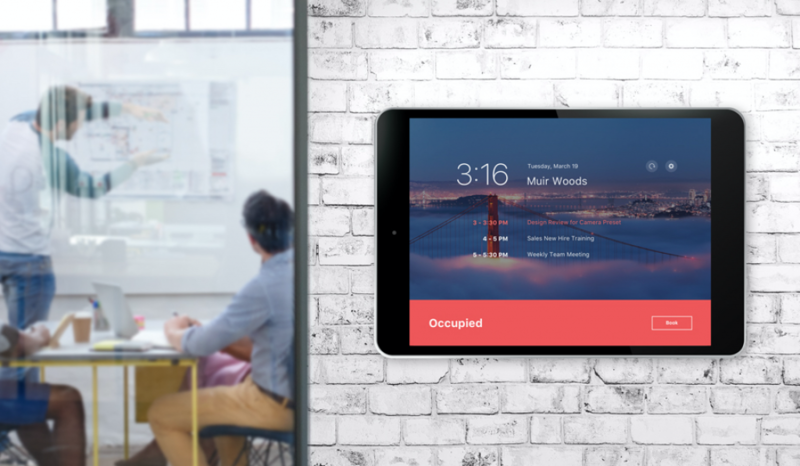 Now our customers have the option to install the Zoom Rooms Scheduling Display on an iPad and place it outside the room to show current availability, display upcoming meetings, and allowing people to easily reserve time for an instant Zoom meeting. Imagine no more scheduling headaches and no more room squatters. This beautifully designed system integrates with Zoom Rooms and your current calendar system, so there is only one system for IT to manage and for the end user to understand. Zoom’s thoughtful design is perfect for the modern office. “With this new functionality, Zoom Rooms further differentiates from other cloud-based conferencing solutions for huddle and board rooms. Zoom effectively balances robust functionality with a streamlined approach that makes it simple for anyone to use, and that approach is certainly evident in the new Zoom Rooms Scheduling Display feature,” said Rob Arnold, Principal Analyst, Frost & Sullivan. To get a 1-1 demo of the Zoom Rooms Scheduling Display, or anything else Zoom, please sign up at zoom.us/livedemo.